Beautiful certificate from the Los Angeles Consolidated Electric Railway Company issued in 1892. 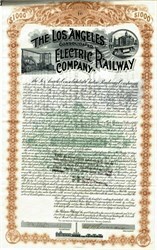 This historic document was printed by the H. S. Crocker Company and has an ornate border around it with a vignette of the operating machinery and a railway car. This item has the signatures of the Company's President, General Moses H. Sherman and Secretary. 53 coupon attached on top. Moses Hazeltine Sherman (December 3, 1853 � September 10, 1932) was an American land developer who built the Phoenix Street Railway in Phoenix, Arizona, and later built other lines and owned property in the San Fernando Valley and Hollywood, California. He also served on the Los Angeles Water Board. Moses Sherman was born in West Rupert, Vermont, on December 3, 1853. He obtained a teaching certificate at the Oswego Normal School in Oswego, New York. With brother-in-law Eli Clark, an attorney, he acquired the capital addition to Phoenix when the town became capital of the territory in 1889. He moved to Los Angeles ca. 1890 to speculate in land and use the new electric railway, or trolley system, to boom his real estate promotions. He made millions and sold out his first lines to Huntington in 1904 for a reported additional six million dollars. At the junction of his streetcar lines west of Hollywood, he built carbarns and created a city called "Sherman". The town would eventually evolve to become the city of West Hollywood. In his role on the Board of Water Commissioners, he received advanced notice of purchases of water rights in the Owens Valley�Owens River for the proposed Los Angeles aquaduct, planned by William Mulholland and Fred Eaton. The additional water to Los Angeles, with the aquaduct's terminus in the San Fernando, triggered a rush by land speculators to buy Valley real estate. The formation of a land speculation syndicate, the Los Angeles Suburban Homes Company, included Moses Sherman and partners Hobart Johnstone Whitley, Isaac Newton Van Nuys, James Boon Lankershim, and Harry Chandler, manager of the "Los Angeles Times," as director. The syndicate purchased the 47,500-acre (192 km2) parcel from the Los Angeles Farming and Milling Company, owned by Van Nuys and son-in-law Lankershim, in 1909. It comprised nearly the entire south half of the San Fernando Valley (south of present day Roscoe Blvd.). The price was $2,500,000, or just under $53 an acre. As part of his speculation in the syndicate purchase, General Sherman (as he was called) retained property in what later became the neighborhood of Sherman Oaks, named for him. The income Sherman received from real estate made up for flagging railroad profits. Sherman directed construction of the new San Fernando Line, a 20 miles (32 km) long extension of the Pacific Electric railway system, to serve the Los Angeles Suburban Homes Company developments. Starting at the terminus of an existing line over Cahuenga Pass from Hollywood to Lankershim (present day North Hollywood), the line went west through the townsite of Van Nuys in 1911, the mid-valley townsite of Marion (present day Reseda), to its terminus in the townsite of Owensmouth (present day Canoga Park) in 1912. The streetcar line, with tracks along the "$500,000 boulevard" named Sherman Way, were the key to the development. By 1912, 45 minute streetcar service from Van Nuys to downtown and the "no speed limit" paved road (if you could get your "Model T" to do 30 mph) were key selling points. The entire grand road's length was originally named "Sherman Way" in his recognition. The name remains on the westernmost original segment from Canoga Park and West Hills to Sherman Circle at Van Nuys Boulevard, and now also extends to Burbank. The easternmost original segment, with its electric railway right of way now a landscaped median/Orange Line route, survives as present day Chandler Boulevard. The north/south original segment, as present day Van Nuys Boulevard in Van Nuys, connects Chandler Boulevard to Sherman Circle. Hazeltine Avenue, which runs north/south from Sherman Oaks to Panorama City, was named after his daughter Hazeltine. After low ridership and automobile advocacy, the Pacific Electric's San Fernando Line was closed in 1952. In the 2000s the MTA Orange Line restored a dedicated route for cross-valley public transportation. An exclusive busway, it uses the former San Fernando Line and Southern Pacific Railroad right of ways, from North Hollywood to Chatsworth. Sherman Way is currently served by local Metro bus routes 162/163. He married Harriet E. Pratt, daughter of R.H. Pratt, a leading player in the Central Pacific Railway of San Francisco. They married in 1885 and had two daughters, Hazeltine and Lucy; Sherman also adopted Harriet's son Robert from a previous marriage. What the Mexicans call elmovimienlo is an indicator of the activity of busi�ness in a city, and the street railroads form a principal factor of that indicator. There are now no less than one hun�dred miles of street railroad, extending along all the principal thoroughfares. In 1887 the first electric line�the Pico street line�was put in operation in Los Angeles. This was the first line to use electricity as a motive power, west of the Rocky mountains. It is a certainty that, for convenient and rapid personal transport, that method of locomotion will be an absolute require�ment of the future. Enterprising men had foreseen this, and in 1890 the Los Angeles Consolidated Electric Rail�road Company obtained a franchise from the city authorities, extending over a period of fifty years, commencing from October 14th of that year. The conditions of the franchise were made very favorable to the Company, which has been successful from the start. There are already forty-seven miles of road in operation all laid with forty-five-pound steel rails and supplied with cars of the latest and most approved style. General M. H. Sherman is pres�ident, Mr. E. P. Clark, vice-president and manager, Major A. W. Barrett, superintendent, and under their able management the affairs of the company are in a thriving condition. Their buildings and plant are situated in the southwestern portion of the city and constitute one of the principal signs of progress, so many of which now mark the advance of Los Angeles. All the buildings are of the most substantial class, being constructed of brick, iron, and Arizona red stone. The main building is one hundred and forty feet by one hundred and twenty-four feet, and contains all necessary offices, a reading room, and the engine and dynamo room. On the south side and on the first floor are the offices of the cashier and superintendent, elegantly furnished and of cheerful aspect. The free reading room, which is sixty feet long by thirty-five feet wide, is on the second floor, and is supplied with books, the daily papers and all the lead�ing periodicals and magazines of the day. On the same floor are the offices of the electrical and mechanical en�gineers, in which are kept the plans, drawings, statements, etc. The engine and dynamo room is worthy of particular description. It occupies the north part of the building and contains at present two low-pres�sure engines of the Thompson-Corliss type, each of seven hundred horse�power. These engines were made by the Golden State Miners� Iron Works of San Francisco, and furnish the power which puts in operation two two-hundred-and-fifty horse-power and one seven hundred horse-power Westinghouse generators. This generator is one of the largest in the world and was constructed expressly for the Los Angeles Electric Company. In addition to this machinery, the company will soon put up two other two-hundred-and-fifty horse-power generators and another engine, which are intended to furnish electric light and manufac�turing power. The boiler-room is eighty feet in length by seventy feet in width, and is equipped with three one thousand horse-power Sterling water tube boilers. Crude oil is used for fuel, and is obtained from Santa Paula, California. The oil, driven by high-pressure pumps, comes in contact under the boiler with dry steam and forms an intensely heated spray. Apart from the economy of this kind of fuel, a great advantage is derived from the cleanliness enjoyed in the use of it. The black dust and suffocating clouds of ashes, and the accompanying dirt which make the typical boiler-room so disagreeable to its inmates, are here conspicuous by their absence. The machine-room is eighty feet long by thirty-six feet wide and is equipped with a fifty horse-power engine, two large jet condensers, two feed pumps, two condensing pumps, all of large size. The machinery consists of iron lathes, planers, wheel borers, wheel presses, shapers and other necessary machinery, all being of the latest and most approved patterns. Car and machinery repairing, as well as that of the electrical plant, is done by the company, which also manufactures no small portion of their rolling and other stock. The car house is one hundred and seventy-three feet long by one hundred and sixty feet wide. An admirable regulation has been adopted and put in force by the officers of this company with regard to medical as�sistance. Each employe is required to pay half a dollar a month, which subscription entitles him and his fam�ily to the best medical attendance and medicine free of charge, the ex�penses being paid out of the medical fund thus obtained. The railroad system of the company is divided into seven branches or main lines. These radiate from a common central point at the Arcade depot, pass through all the most important thor�oughfares of the city and extend to all the best suburban places of resort, present or prospective. The first line leads to the University station and will run its cars through to East Los An�geles; other lines extend to West Lake Park, Elysian Park, and Boyle Heights. That the success of the Los Angeles Consolidated Electric Railroad Com�pany will be marked, there is no doubt. The electric company has been fortu�nate in securing a favorable franchise for the period of half a century; the foresight of its promoters, in looking beyond the present, and in their mind�s eye seeing the densely crowded streets of Los Angeles twenty years hence, and the many heavily loaded cars of their electric line passing to and from without ceasing, has secured for the stockholders future wealth. The future welfare and prosperity of Los Angeles are secured by two great factors of success�railroad communica�tion and the inexhaustible fertility of the surrounding country. With such a system to develop the outlying country, it can be seen why Los Angeles is growing so rapidly, and it should be noted that the indi�cations are that the city is to be the great railroad center of the southwest. It is at present the central point of a number of roads, chief among which are the Atchison, Topeka and Santa Fe, the Southern Pacific, while the Terminal leading from the sea to Los Angeles, through to Pasadena, and now being connected with the Lowe Sierra Madre Mountain railway, is supposed by many to soon become a third transcontinental road.